Moroccan Oil is one of my favorite things to put on my hair - the actual Moroccanoil Moroccan oil with the blue and orange label and incredible smell. It always leaves my hair glossy and manageable. Unfortunately, it's also $43 for 3.4 oz and I don't have money to throw at that kind of thing right now. Luckily, I went out to purchase a new anti frizz serum and I noticed a ton of drugstore lines are now carrying their own Moroccan oils. I picked up this bottle from Organix - roughly the same about of fl oz but for $8. The only time I know how to do math is when I'm calculating savings like this, I know. I was nervous about how this would hold up to my beloved Moroccanoil brand. I was let down when I realized this didn't have the same fragrance. I usually love unscented items but I love that spicy, woody scent. I was also initially kind of put off when I worked this into my ends and found that they were left a bit sticky. 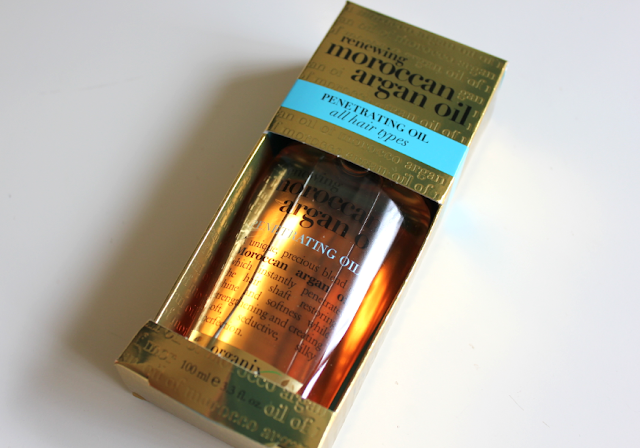 I never get the light version of Moroccanoil but it initially seemed like this brand was too heavy for my fine hair. I straightened my hair and slept on it and my ends were as good as new when I woke up - almost literally. Not only was the stickiness gone but my ends looked soft and healthy. I'll probably be very conservative from now on if I'm applying this to my hair before going out. This does say for all hair types but I probably should have gone with the "light" version they were selling if I wanted to fuss less. Still, this is a great, accessible dupe for the salon exclusive and salon priced Moroccanoil. I'd especially look into this if you have thicker hair. If it can work wonders on my fine, brittle ends, I can only imagine how it would transform healthier, fuller hair. I'm sure it would be Disney princess level.